Rolls-Royce has unveiled a new luxury yacht concept design which the company says showcases the advantages of advanced ship intelligence solutions and hybrid propulsion based on LNG fuel and battery power. The new yacht design, known as the Crystal Blue, was unveiled this week during the Global Superyacht Forum (GSF) in Amsterdam. Crystal Blue also comes with 42-meter tender boat, known as Blue Shadow, which doubles as an LNG bunkering barge. “Crystal Blue has been designed specifically to show how new technology can meet the yacht sector’s increased demand for higher performance, greater operating ranges and increased levels of guest comfort, without impacting the environment,” said Oskar Levander, Rolls-Royce SVP Concepts and Innovation and a keynote speaker at the GSF event. Among the concept’s many innovations, Crystal Blue will use an intelligent dynamic positioning system to automatically control twin azimuthing thrusters and a TT1100 bow thruster. 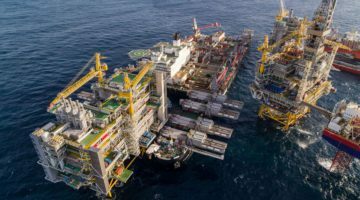 Rolls-Royce says this sort of system is typically reserved for offshore vessels for use during operations that require advanced stationkeeping. But on Crystal Blue, the DP system will allow the yacht to remain in place without the use of an anchor and, quote, “‘follow the sun’ across the sky to ensure sunbathers can enjoy the ‘optimum tanning angle’ while lounging on deck”. At first glance, it may also appear that Rolls-Royce forgot to include a bridge in the concept, but Levander explains that recent advances in ship intelligence and remote-control technology has allowed them to simply move the bridge to below deck. “Our ship intelligence and remote-control concepts have allowed us to design a yacht for the future that has the bridge located below the bow, inside the vessel. The crew is able to monitor and control the vessel using sophisticated sensors, cameras, display screens and situational awareness technologies; but an internal bridge frees up the traditional area of the bridge in the forward part of the superstructure to let owners and guests enjoy a panoramic vista that is traditionally only enjoyed by the crew,” said Levander. Crystal Blue features a number of other technologies more familiar to the commercial sector than the marine leisure market. The bridge console is based on Rolls-Royce’s proprietary Unified Bridge design, which has already delivered to a number of ship types, including large superyachts. It also features technology Rolls-Royce and Svitzer demonstrated in the first remote controlled commercial tug earlier this year. The Rolls-Royce team has also incorporated some safety features into the design, such as a ‘safe room’; a citadel in which guests and crew can seek refuge in the event of an unauthorised boarding. Once inside, the crew can override the controls and operate the yacht remotely or direct a shore-based centre to pilot the vessel. Designed for 12+ passengers and 12 crew, the 62 meter Crystal Blue is based on a composite or aluminium hull operating a power plant based on the Rolls-Royce hybrid LNG/Battery SAVe-CUBE system configuration. Rolls-Royce says the machinery consists of twin LNG-fuelled 16V4000 MTU M65-N generator sets working in parallel with a battery bank to provide 1MWh of genset-free power during port stays. Two low-weight carbon Azipull thrusters provide propulsive power to achieve maximum service speeds of 20 knots. Although LNG fuel is increasingly specified for commercial vessels, the size of the fuel tanks and a lack of LNG bunkering infrastructure has been a major barrier to the yacht sector embracing the cleaner-burning fuel. Operating in convoy, Blue Shadow is a smaller 42 meter, remotely-controlled, steel-hulled support vessel used for transporting and launching the mother ship’s tender, helicopter and any other ‘toys’ that the owner may have. It also allows designers to make better use of the aft area of Crystal Blue for guests. The shadow boat also doubles up as the owner’s personal LNG bunkering barge.